Copdock Mill is a family-run business with over a century of trading expertise, manufacturing and supplying premium quality foods for cage and wild birds, poultry and household pets such as dogs, rabbits, guinea pigs and hamsters. Today, the company also supplies its own specialist fishing bait and essential foods and clothing products for the equine industry. With four generations of the Gladwell family having played a part in the business, customers are assured of a first-class personal service at competitive prices. Since 1970, Copdock Mill has manufactured its own wild bird seed mixes and coarse rabbit feed mixes. The business has since diversified to produce its own range of cage and wild bird mixes and seeds, small animal food, poultry feed and premium fishing bait. Each mix is designed to provide the most comprehensive nutrition for your animals, with no need for expensive supplements. 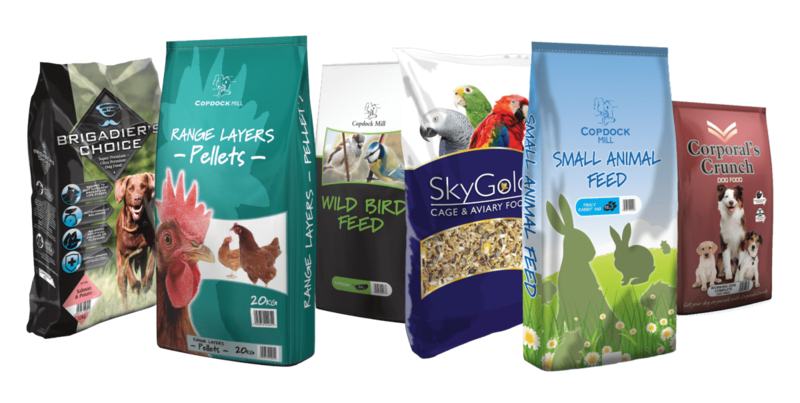 Copdock Mill is now one of the largest independent distributors of animal food supplies and accessories in the south-east of England. The company’s Pet & Country Stores are located throughout East Anglia, from Suffolk to Northamptonshire, as well as a trio of well-stocked stores in Kent. The team’s helpful, knowledgeable staff are always on-hand to cater for your needs in-store. From pet and poultry products to smallholder and equine accessories, if you want it, the team can get it. IF YOU WANT IT, WE HAVE ITChoose from over 75,000 sq ft of stock. PERSONAL SERVICELiaise with the same account manager and delivery driver for every purchase. NATIONWIDE DELIVERYA swift, reliable fleet of delivery trucks you can depend on, anywhere in the UK. WE’RE HERE TO HELPWith a commitment to impeccable customer care, the team will respond quickly to all your needs. Thinking of becoming a trade customer? We have been wholesaling to the pet and equine industry for over 40 years. A professional, independent wholesaler and manufacturer with strong customer care values. Established in 1912 by Herbert George Gladwell, Copdock Mill originally started as a country mill. The family tradition continues today, whilst diversifying to produce and supply premium quality animal food supplies and accessories to customers nationwide. With nine Gladwells Pet & Country Stores open across East Anglia and the south-east of England, there’s always an independent pet store nearby to get friendly, professional advice on all your pet, poultry and equine requirements. Copdock Mill is committed to producing top-quality nutrition for animals at affordable prices. Manufacturing own-brand feeds for birds, small animals and poultry enables the team to source the finest ingredients for your animals, without compromise.